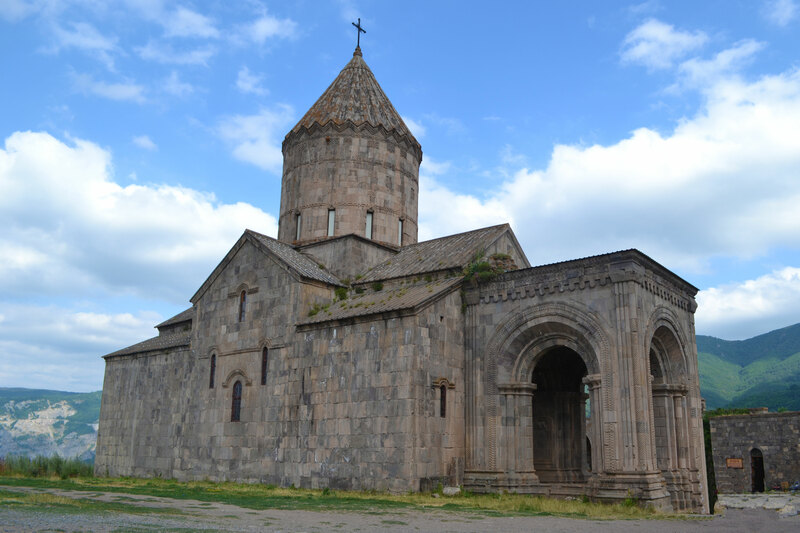 Welcome to Part II of My Armenian Adventure. You can find Part I here. 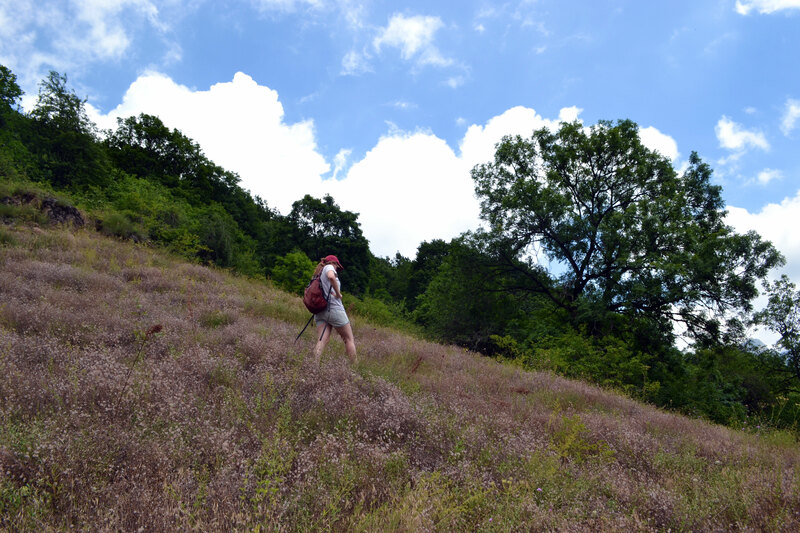 …Luckily we were able to hitchhike to our hotel, which was convenient given the midday sun. And the hotel itself was nice, but the owner was horrendous. Rather than welcome us with open arms after our long journey, he immediately asked us for payment in cash, which we didn’t have. This seemed to catapult him into a fit of rage. He then decided it would be okay to smoke in our room whilst he was being rude to us. I later concluded he was probably an oligarch, as he sent a taller, more bald man with a cigarette hanging out the side of his both to bang on everyone’s doors to ask for money. Bang on doors with one hand, carry a thick wad of cash in the other. We decided to escape immediately and took a taxi (due to being in the abyss) to the peninsula. 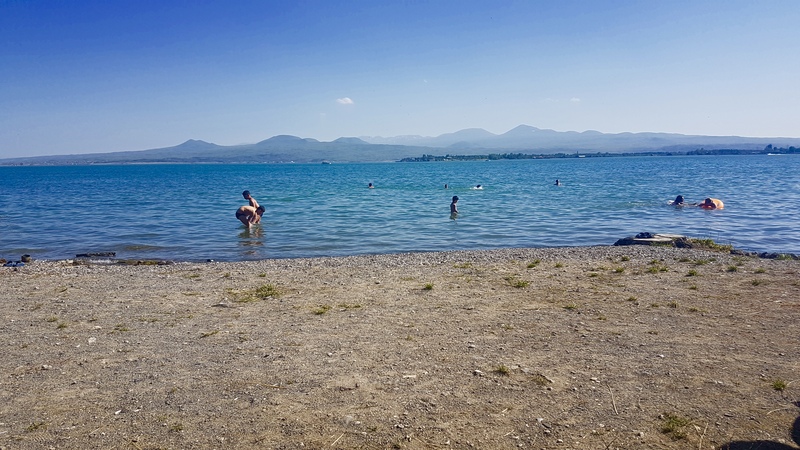 Despite the lake being absolutely humongous and taking up a whopping 1/6 of Armenian territory, everyone seems to congregate right here in this one spot. 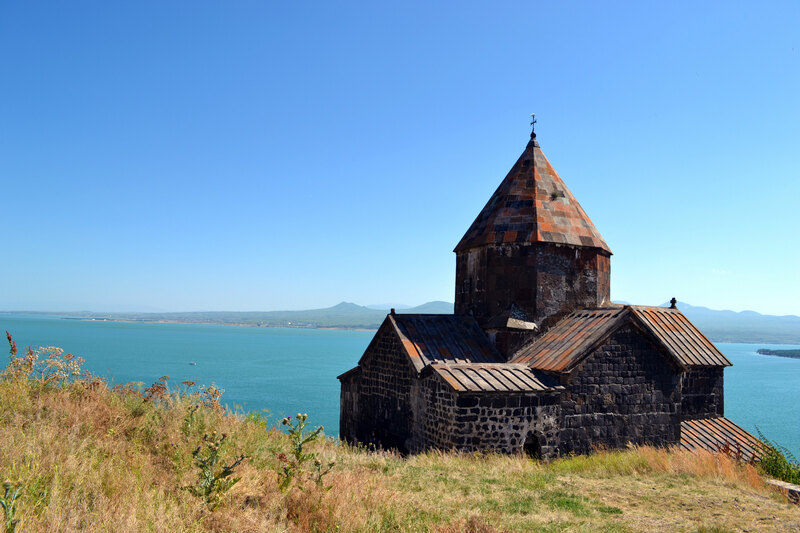 I suppose it’s because that’s where you’ll find Sevanavank, which is pretty good reason if you ask me, plus there are actual facilities to be utilised. It was absolutely rammed with people around the lake. And what made things worse was the repetitive Russian techno that was blaring out left, right and centre wherever you went, and I could not for the life of me escape it. I was pained. Alas, I grabbed a beer, put my headphones in and did the whole sunbathing and swimming thing (poor me). 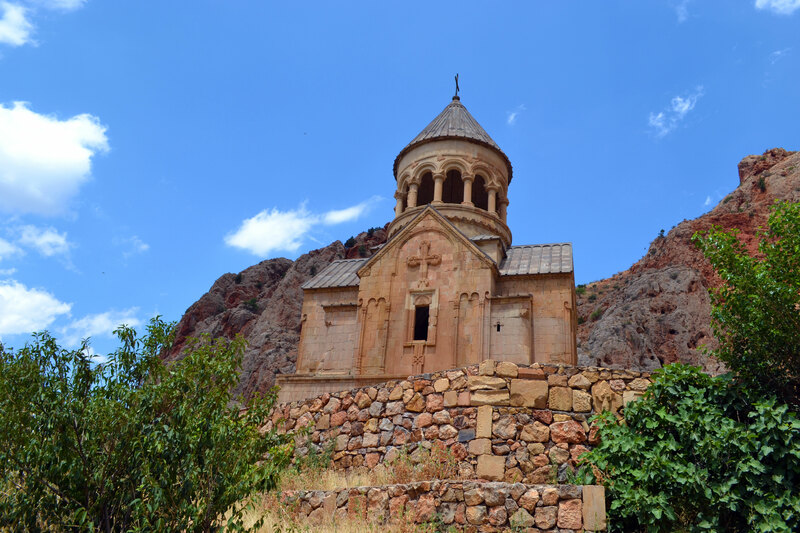 If you want the money shot of Sevanavank Monastery, which is impressive in all lights, I recommend you hang around until sunset. It was not only quieter at this time, but it made for some interesting colour palettes to snap. Not wanting to venture back into the city of seven, we decided to dine al fresco on the waterfront. In terms of dining options, most people seemed to be barbecuing along the beach in big groups, and from what I gathered we were basically limited to eating at hotel restaurants. Now, Emelyn is vegetarian and I am flexitarian, so I ordered a kebab, as usual, and she was left to pick from the remains of the menu that sounded meat-free. No problem. She ordered ‘greens’, ‘bread’ and ‘garnier of potato’ – a somewhat depressing ensemble on paper. But it turns out ‘greens’ are not ‘greens’ as we know them, and what arrived was in fact a whopping great plate of fresh herbs. We had absolutely no idea what to do with said herbs and it was clear that there was a very particular way to eat these, which we would later find out. 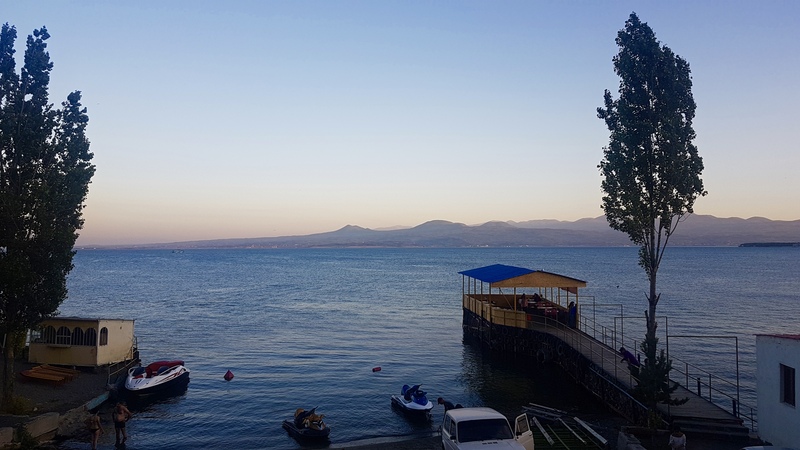 And whilst we hadn’t quite mastered the art of Armenian dining, soaking up the view overlooking the lake was something we couldn’t go wrong with. We broke down on a mountain, right there and then. We’d already broken down in the desert in Azerbaijan so were good at remaining cool in these situations, but what truly baffled me was the driver’s reaction, which was to document this moment with a selfie. Utterly bizarre! 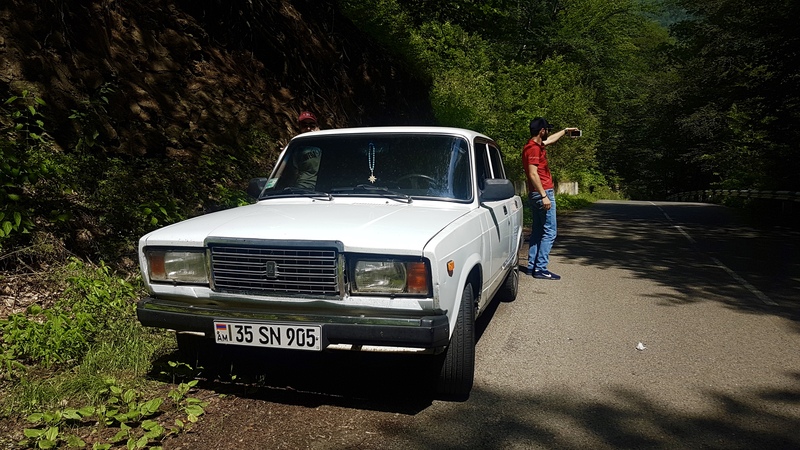 After thirty minutes or so when the smell of burnt clutch had disappeared from our nostrils, he managed to tweak something in the bonnet that seemed that resurrected the Lada, for better or for worse. 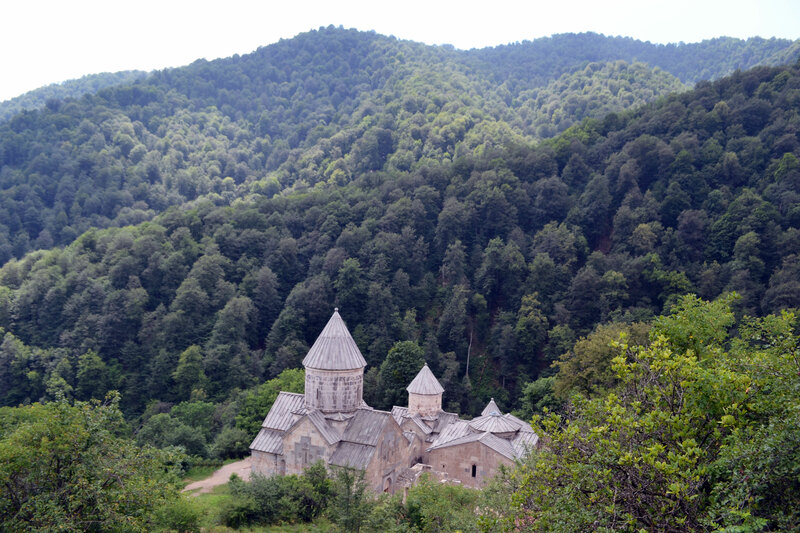 Haghartsin Monastery was one of the highlights of Dilijan and you can get a taxi to take you there for 2,000 Dram. This 13th century gem rises out of the treeline to claim complete ownership of the landscape, with its bold white façade and towering columns. Beaut! Emelyn searching for my phone as I document it with more easily-lost technology. 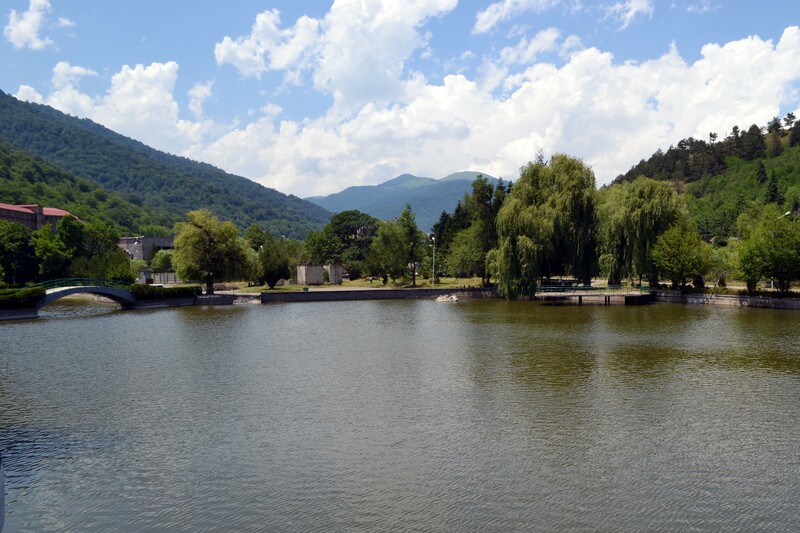 There’s a really nice little café down on the lake called Café #2 – and let’s be honest, that isn’t a great name – serving up pretty decent home cooked food, and the staff are super friendly with good English. Not bad views of the lake either. The marshtruka back to Yerevan actually goes from opposite here, so it’s a good point of reference to know. However, what fascinated me most about the process of buying a ticket was that to do so, you walk into an office resembling an empty air hanger – which is fundamentally too large for its contents – where you will see a lone woman sat at a table reading the newspaper. There is no indication that she works there, but you just hand her your money anyway. She then doodles something on a scrap bit of plain paper, and voila, you are on your way back to Yerevan. 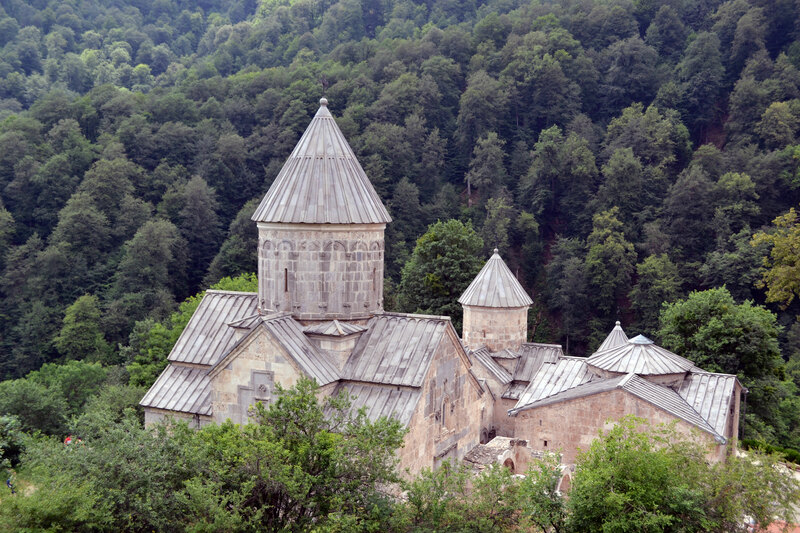 Located in the southern-most province of Syunik, or the most southern marzer, this monastery was founded in the 9th century and is one of Armenia’s most recognisable sights today, however getting there is no quick exercise. 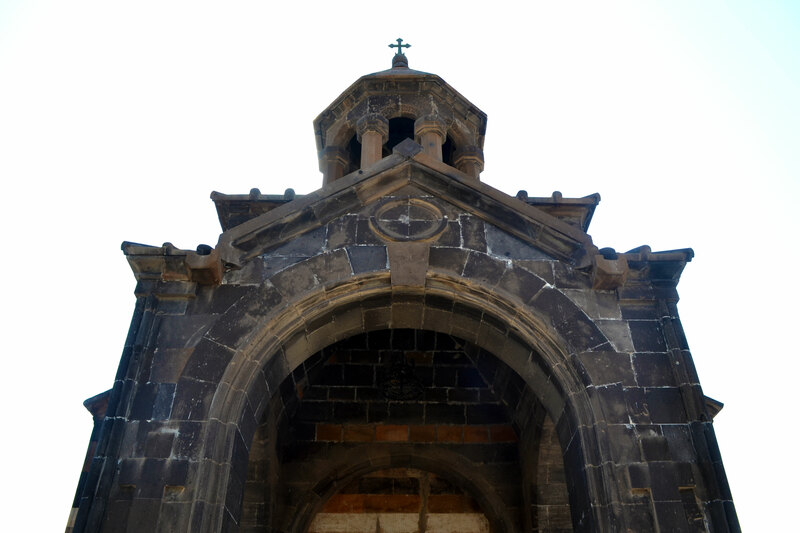 I woke up at 6:20 ready to meet my overly enthusiastic guide who insisted on immediately launching into a full account of Armenian history, which would last the entire fourteen hour journey as I bobbed up and down on the poorly-maintained roads. 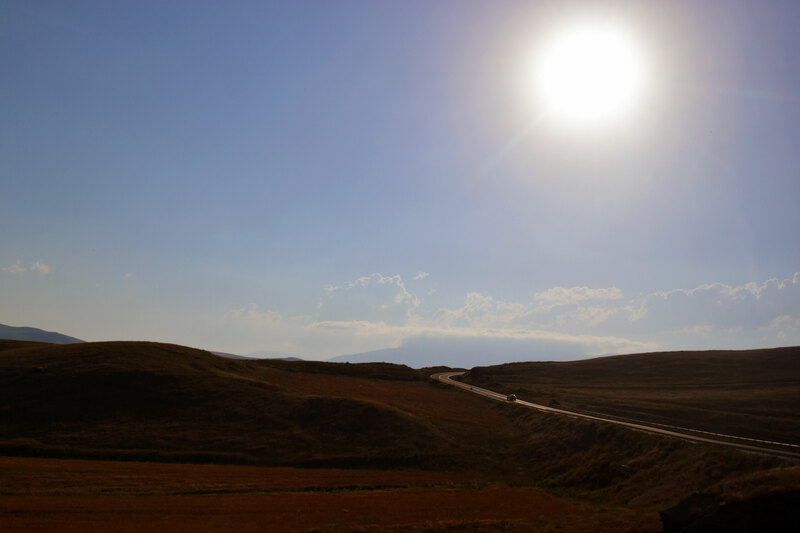 She did warn me that I’d likely want to throw my guts up once we left the relatively flat province of Ararat to head into the mountainous terrain, and she was quite right. 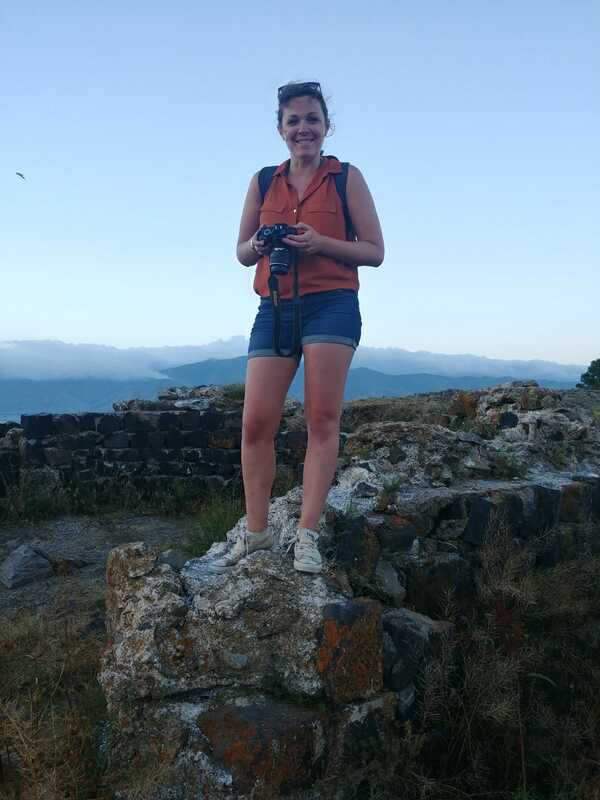 Armed with tenacity and resilience, coupled with the warmth and openness that seems to flow throughout the Armenian people, our guide was almightily passionate about her country, its history and her heritage. And fortunately for me, she was generous and open in sharing this. 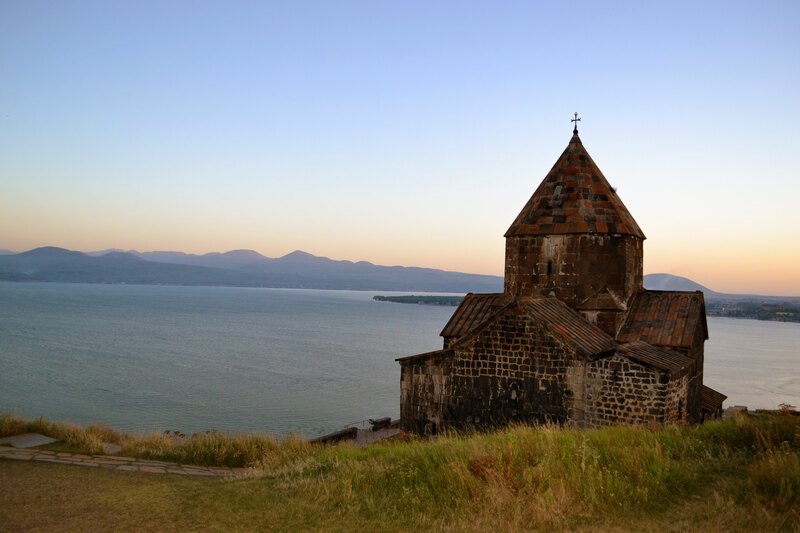 As one of the oldest countries in the world, Armenian history is rich. 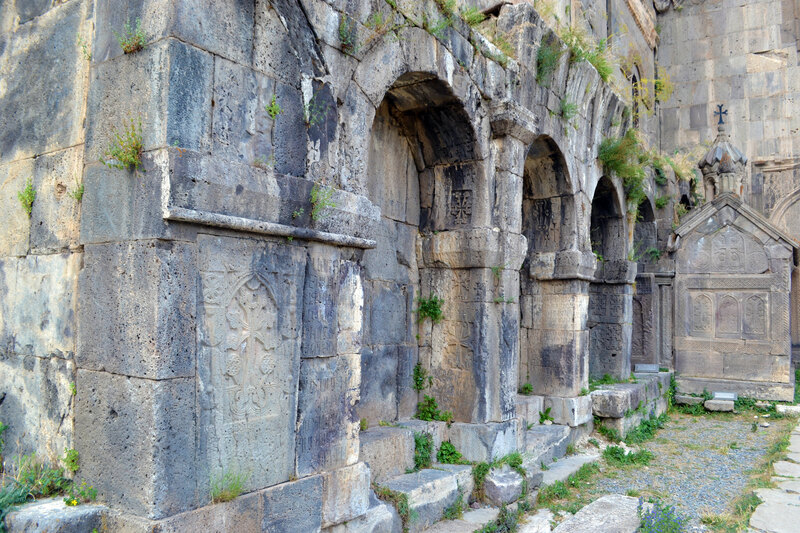 From learning about the oldest known ancestors of modern Armenians, the Hayasa-Azzi tribes, to the Rubinian dynasty of the Fourth Armenian Kingdom, the Armenian history books are teeming with lessons to indulge the historian within. 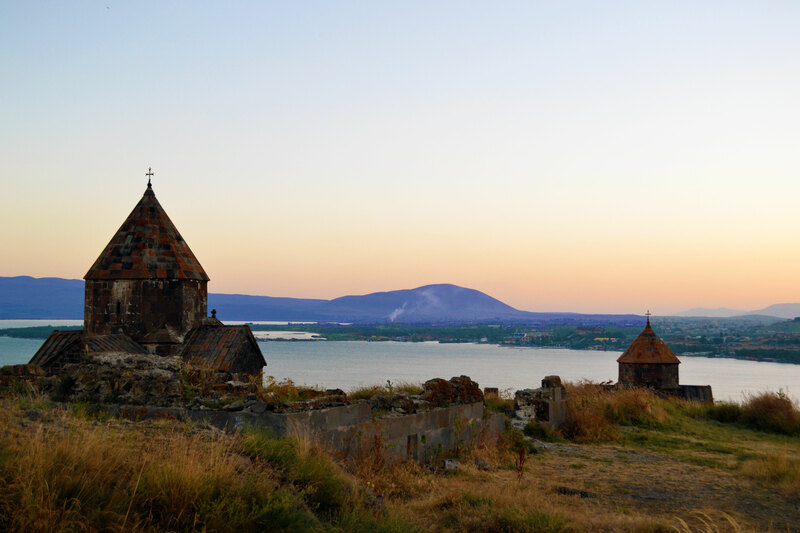 Our guide’s stories were utterly compelling to hear and also provided a much-needed opportunity to connect with more recent Armenian history on a more personal level – one that you don’t get in the books or in the museums. Even in something as simple as learning about the origins of the Armenian flag, which is absolutely emblematic, the way she described it was hard hitting. Speaking with the locals is the best, most informative history lesson you can hope for. Driving out of Yerevan, otherwise known as the ‘pink city’ due to its use of pink stones, we passed through the northern side. 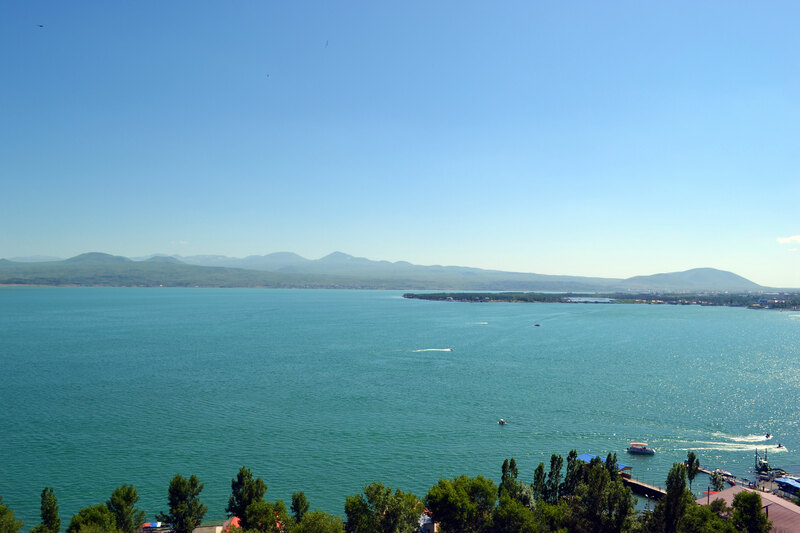 The city was designed in a way that it is split into different sectors such as finance, entertainment etc., but the northern side was the old industrial area during Soviet times. The hangover from this is still very much in place, teeming with abandoned factories that would have once harboured huge production lines, and buildings lining the roadside after becoming obsolete overnight with the declaration of independence. 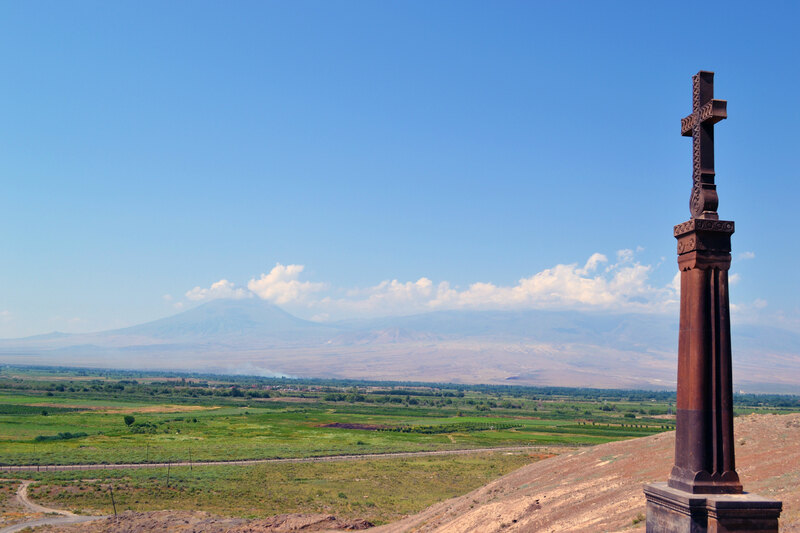 We could see Ararat for the first time since being in the city that morning as we passed through the level planes of Ararat Province. It is in this province that we passed hundreds of white stalks on the side of the road adjacent to the wetlands. I asked all about this and it’s apparently an ongoing scheme to help residents better understand the importance of the wetlands, and to help monitor the local stalk population by getting them involved in the process. She made it sound a bit like a neighbourhood ‘best stalk’ competition. 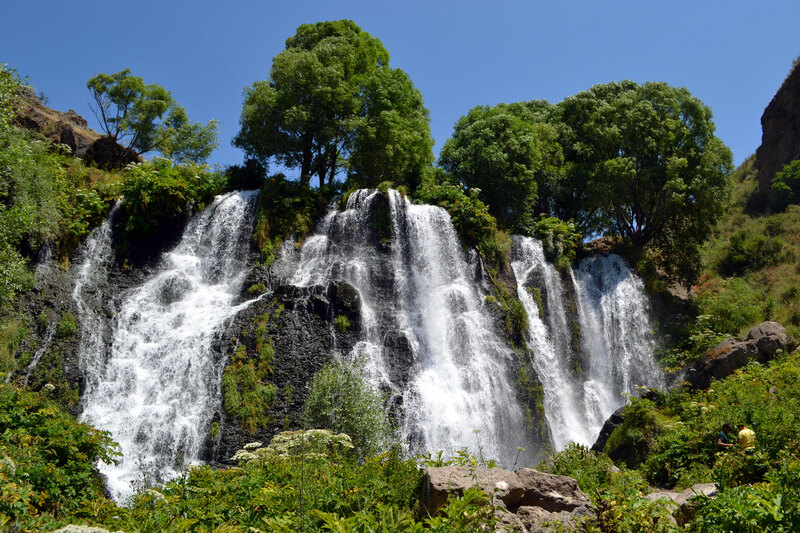 In fact, hundreds of these majestic creatures stop here on their long journey from Western Europe to Africa, so the region is therefore quite popular with bird watchers. 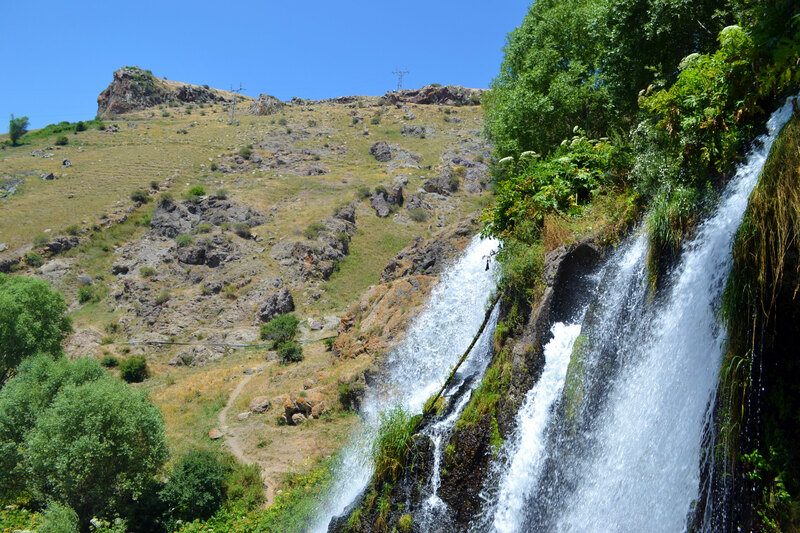 We stopped at this waterfall on the way to Tatev, which was about a fifteen-minute hike. I decided it would be smart to hike above the waterfall in order to avoid human contact (one of my fortes in life) and to a place where I could just eat my cheese-stuffed lavash stuffed in peace. This turned out to be an awful idea as it was a lot more difficult to navigate back down than I originally thought, but does sum up what great lengths I’ll go to avoid humans. 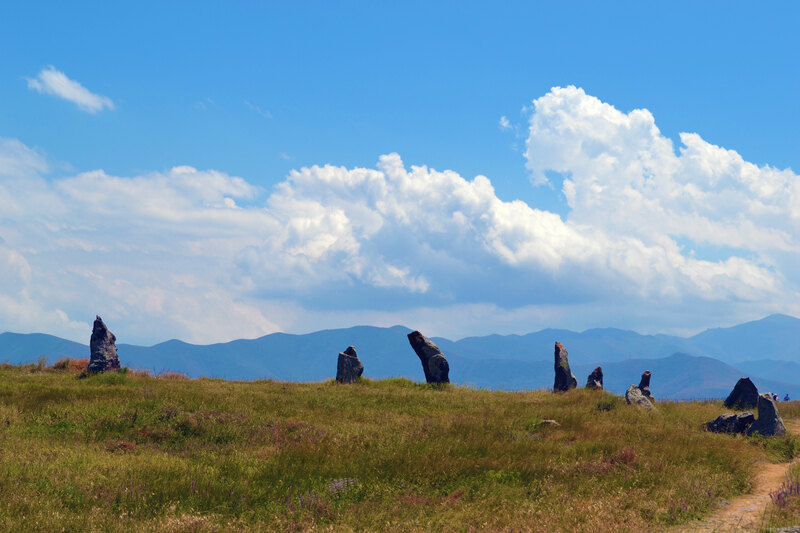 Next up was what has been dubbed as Armenia’s Stone Henge – Zorats Karer. 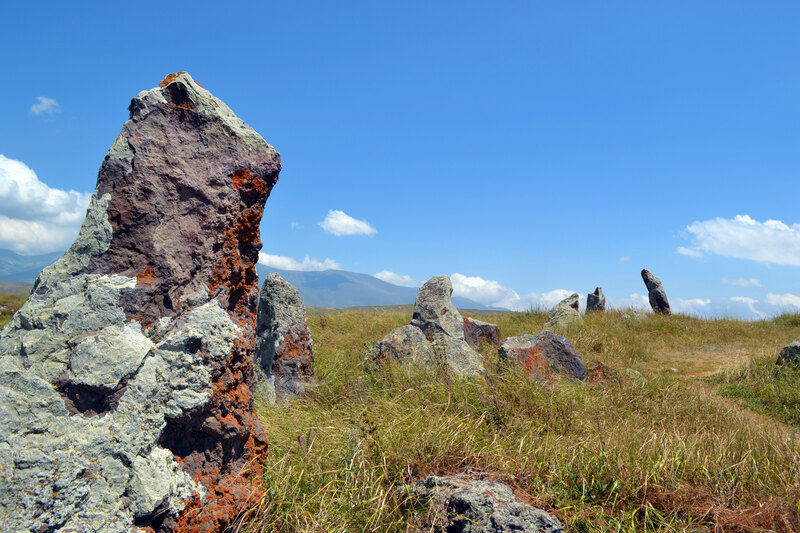 This prehistorical archaeological site might look like just a bunch of rocks, but these have been strategically placed with precision and have an illusive significance. Each of the rocks has a small hole carved into it. Now, some people say these holes were used to drag the rocks, but if you look around, only about 40 of the 100+ rocks have them. Additionally, the holes are located near the top, so would have been far too flimsy to do so. 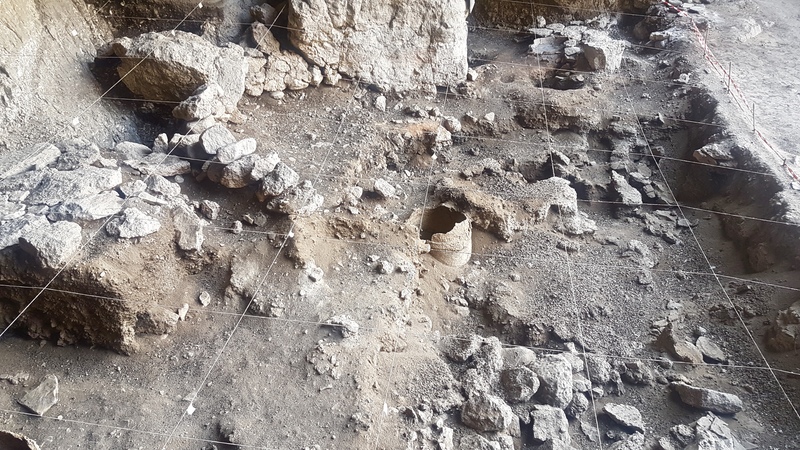 This is what led some researchers to believe that the archaeoastronomical claims that it was once an observatory may well be true, as many of the holes align with consolations and could be use for astronomical observation. However, there is still much debate surrounding this. Either way, the site blows Stone Henge out of the water. 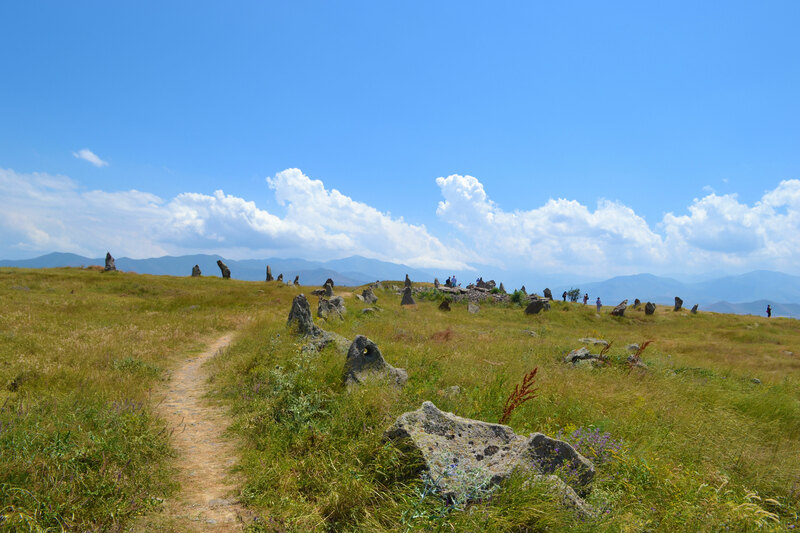 Not only can you go right up to the stones and touch them, unlike the UK equivalent, but you are surrounded by endless countryside and just a handful of people. It’s serene. It’s breathtaking. It’s an all-round Armenian itinerary topper. 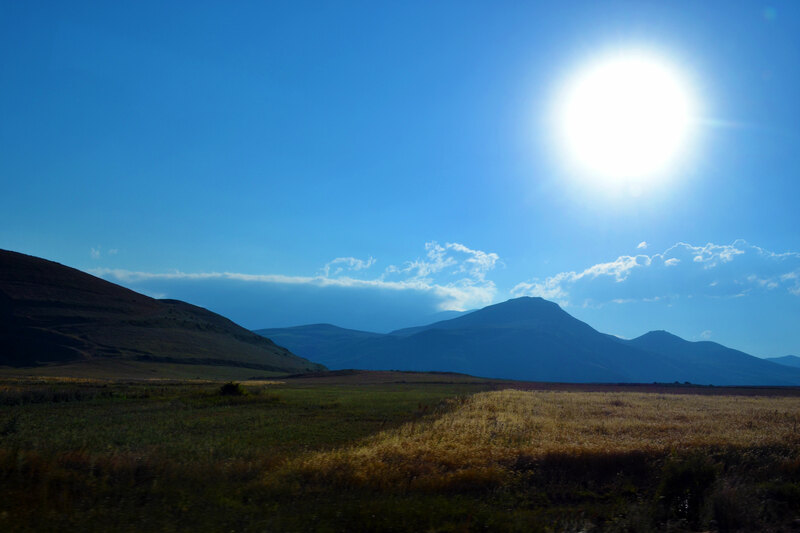 The Armenian countryside really is quite something. 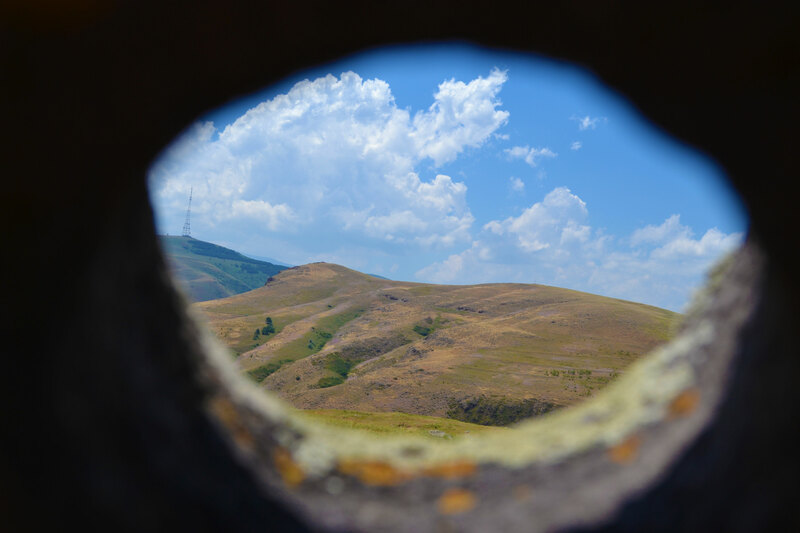 The ‘observatory’ was located in the middle of nowhere and surrounded by colourful rolling hills that kissed blue skies as far as the eye can see. 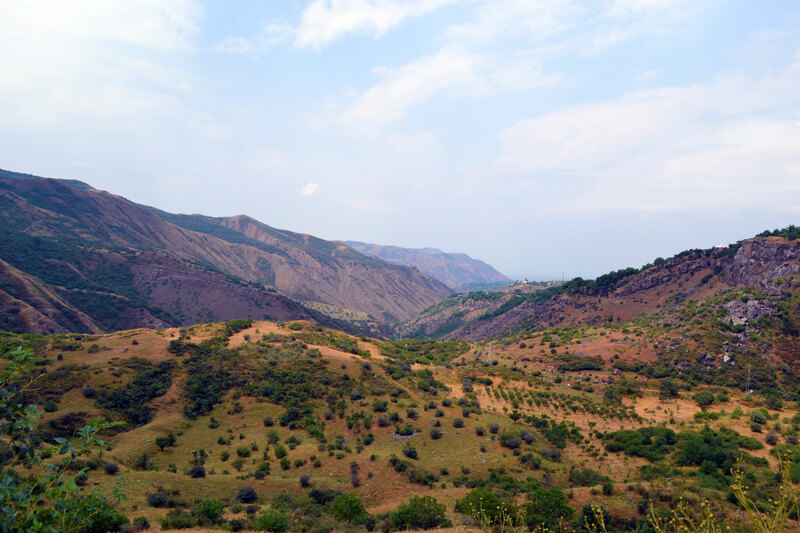 What struck me most about my time in Armenia was indeed the way the scenery changed so rapidly and how, for a country of its size, each province had a distinct and recognisable climate zone. 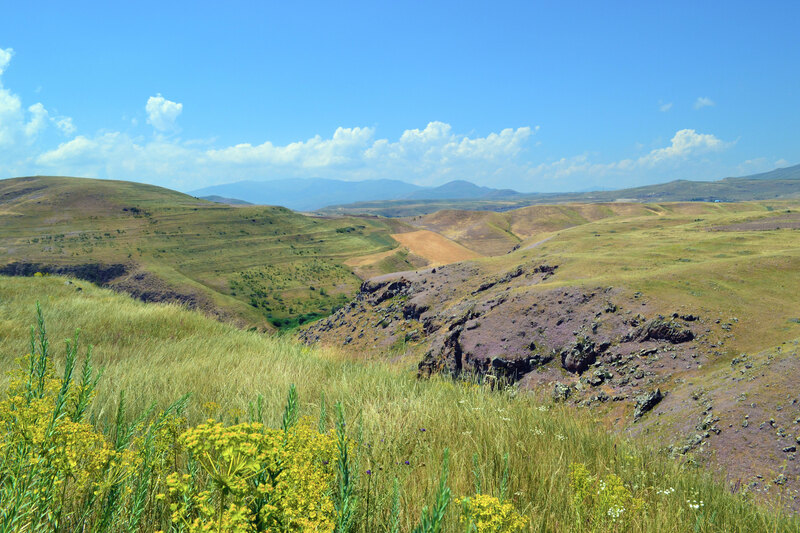 The Ararat region was flat and home to wetlands, whilst the Vayots Dzor region transported me back to Nevada with its red rocks and towering cliff faces, surrounded by dry land where desert animals thrive. 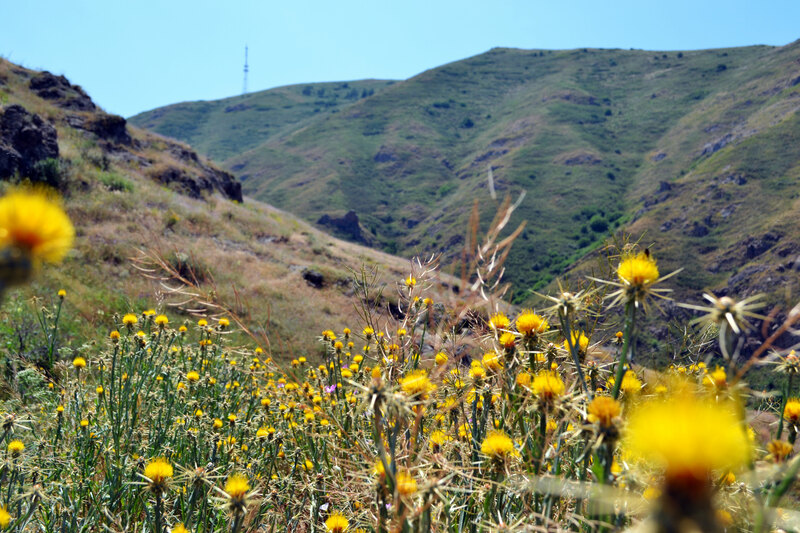 Rolling into Syunik, I felt like I’d wandered into an Alpine region at times, with meandering hills topped with pink and yellow flowers. 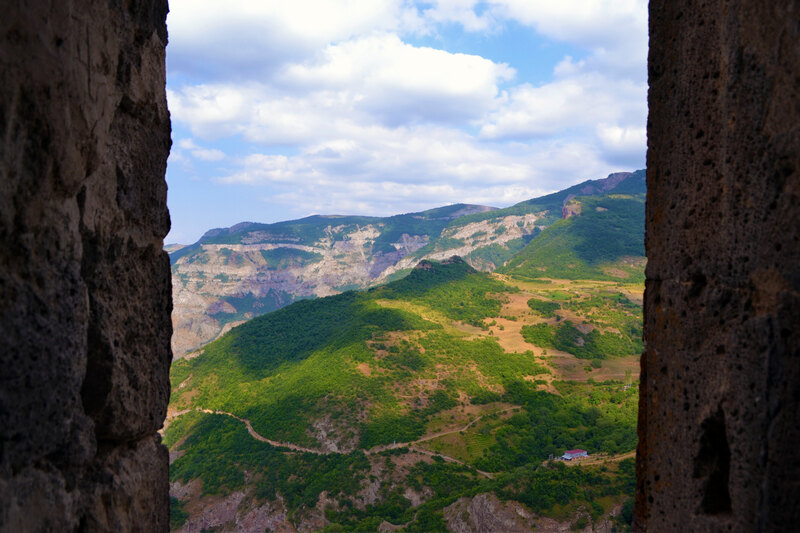 All the way to Tatev, I snacked on apricots and dried pomegranates, which are the national fruits, but I couldn’t fall asleep even though I was exhausted through fear of missing some scenery. Massive FOMO. 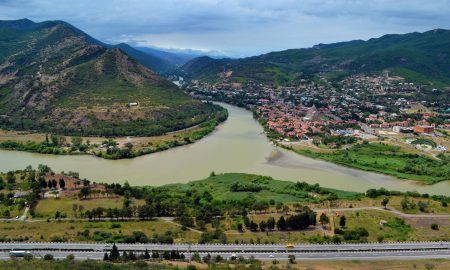 Our destination, Tatev, was precariously balanced on a cliff overlooking the Canyon of Vorotan River and provided mind-bogglig views of the canyon bed and Devil’s bridge below. 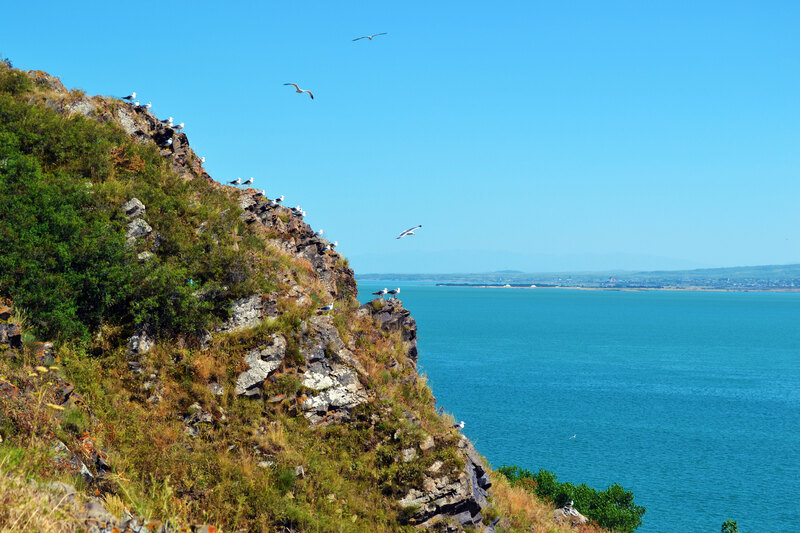 According to one legend, the name came from the master who, upon finishing it, crossed himself and hurled himself off the cliff saying <Օգնիր,Սուրբ, տաթեւ> (Ognir, Surb, ta tev) which translates to something like “Let the Holy Spirit give me the wings”. Upon making this statement, his back spouted wings and then it was that he flew away. 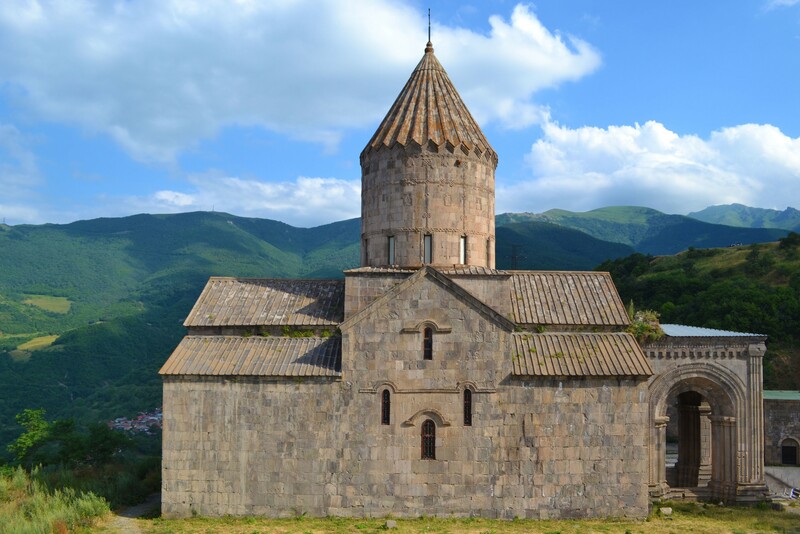 It was then known as Tatev in honour of his successful plea to God. 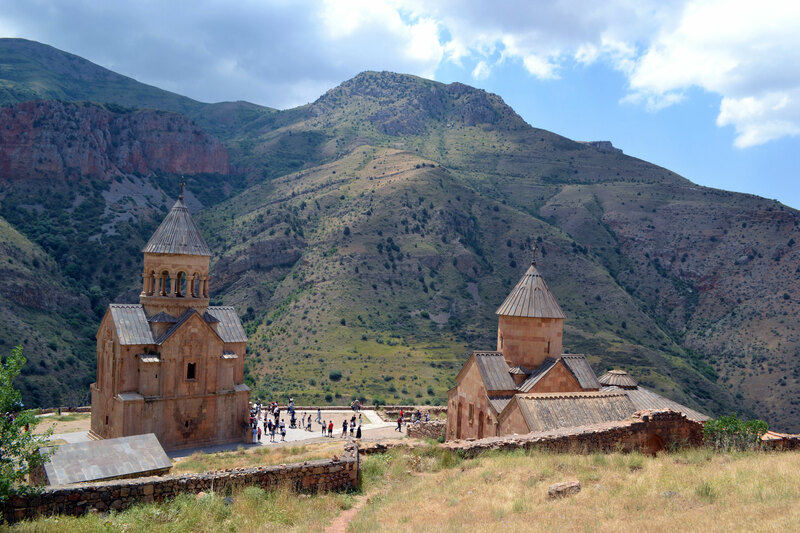 There are actually a bunch of legends surrounding the etymology of Tatev, however what’s sounds most convincing to me is that it is named after Eustateus, a disciple of St. Thaddeus the Apostle, who preached in the area, and his name gradually evolved to ‘Tatev’. To get to the monastery itself, we took what is supposedly the longest reversable cable car in the world, stretching over 5km. It took around 15 minutes to get there, and upon arrival we were served more ‘greens’. Except this time we were given a lesson in how to actually eat them – roll them into lavash with fresh cheese and veg, and voila! (Not ‘eat them raw with no accompaniments’ as we had before). 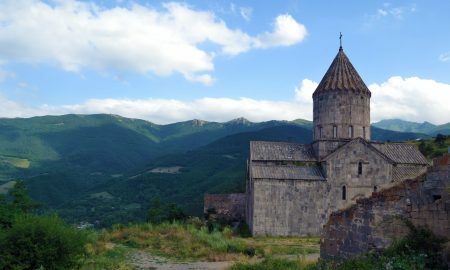 Tatev was part of the wave of Monastic Feudalism that was rife in Medieval Europe between the 9thand 15thcenturies, and as a consequence became a revered monastic centre. 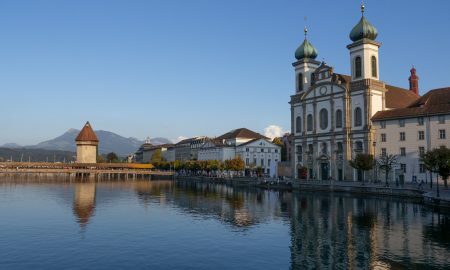 It had great economic power, which, looking around, is reflected in its architecture. 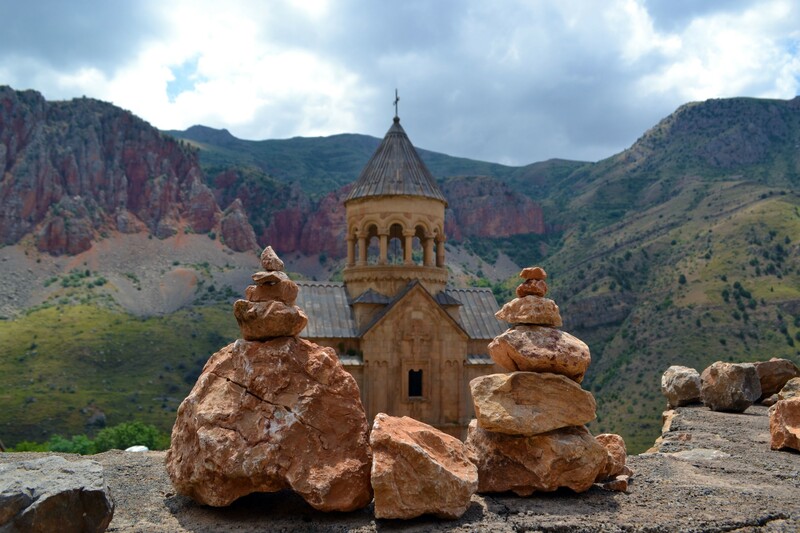 The views at the monastery itself were, as you’d expect, pretty impressive. 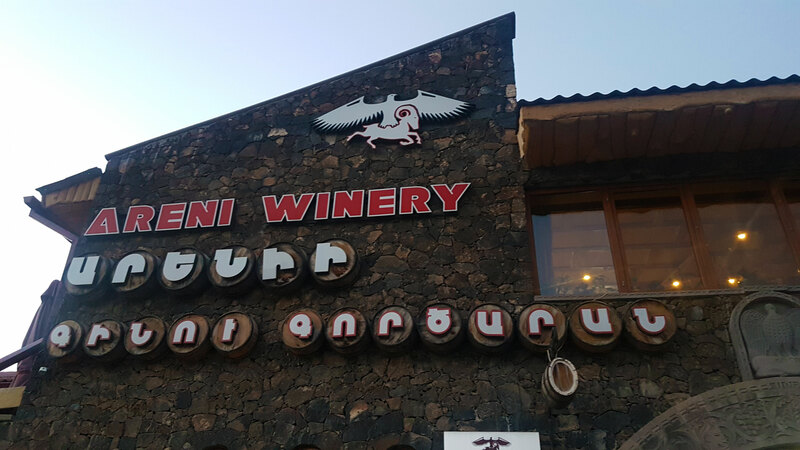 We stopped at Areni winery on the way back where we tried 13 different wines, which might seem insane, but half of them were fruit wines to which they add copious amounts of sugar, rendering them more like Ribena. 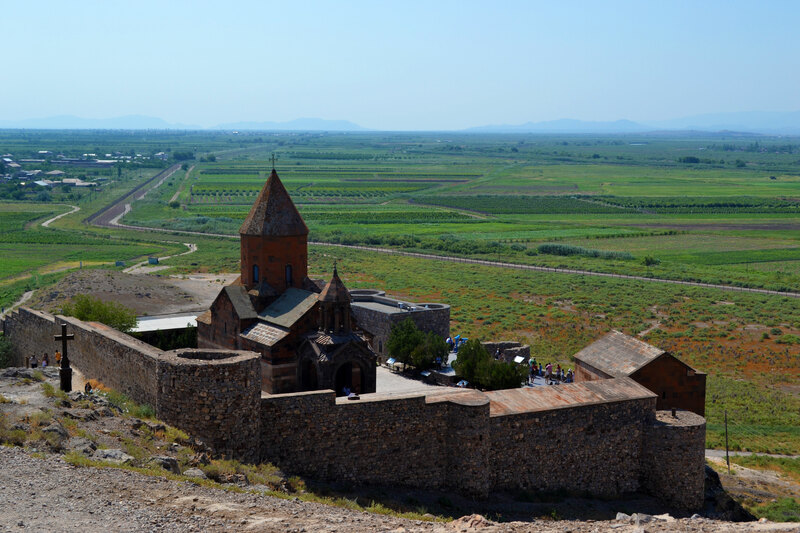 The wines were good – better than Georgian wine if you ask me, especially the kvevri wine. 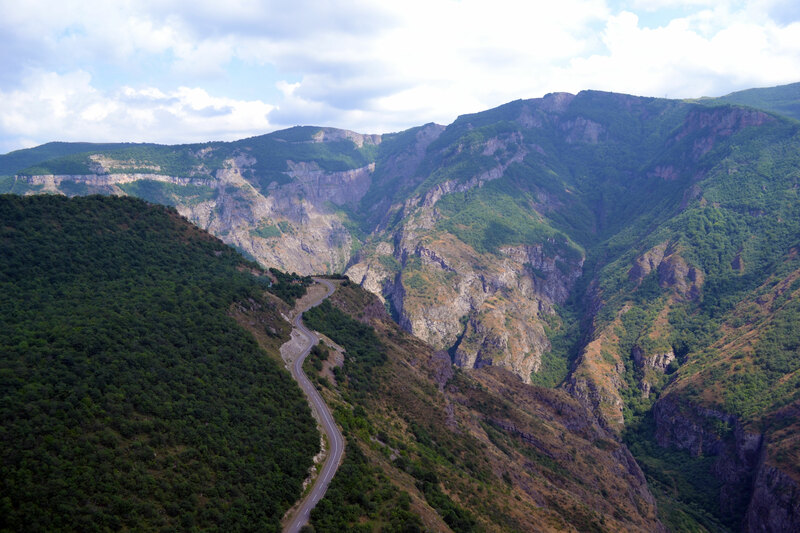 It was even more terrifying taking the hairpin bends at night, and it took four long hours to get back to Yerevan. 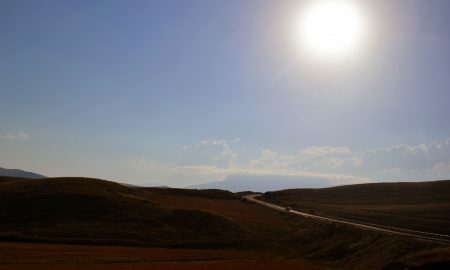 As the road that connects Iran with Georgia, I’d assumed things might have been in slightly better condition, but I did enjoy getting so close to Iran and intersecting with so many countries. 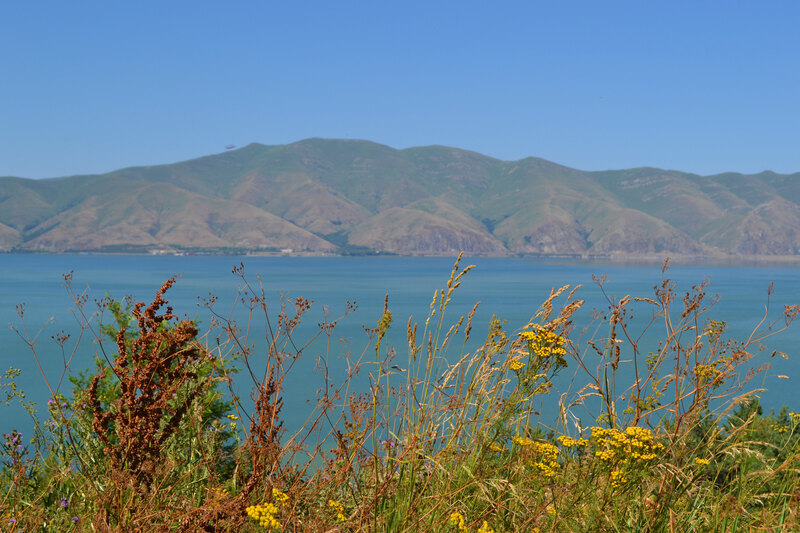 At one point we could see Azerbaijan(/Armenia), Armenia and Turkey. 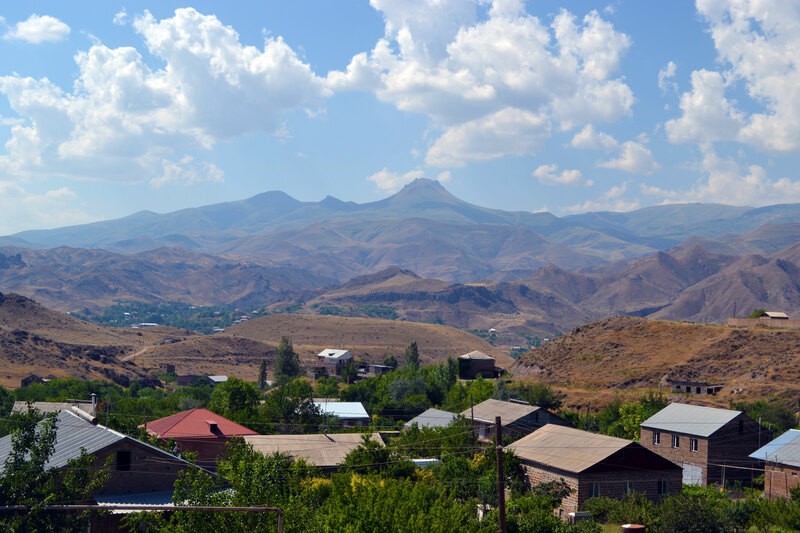 It’s also the closest I’ve been to Karabagh, which I am now dying to get to! Due to tiredness, on my last day I decided to join one of those old people tours where they do everything for you. 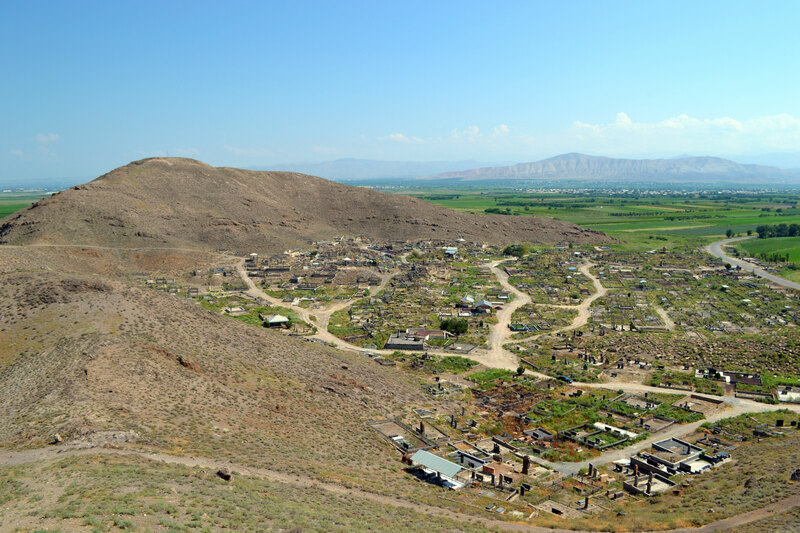 Our first stop was Khor Virap on the Turkish border, and this was the part of the day I was most looking forward to. 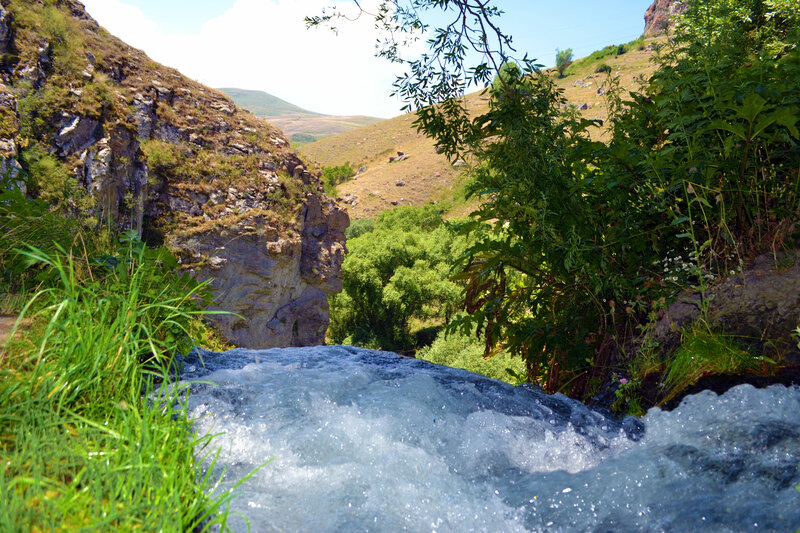 Located just 45 minutes out of the city, this is the closest you can get to Ararat without leaving Armenia. 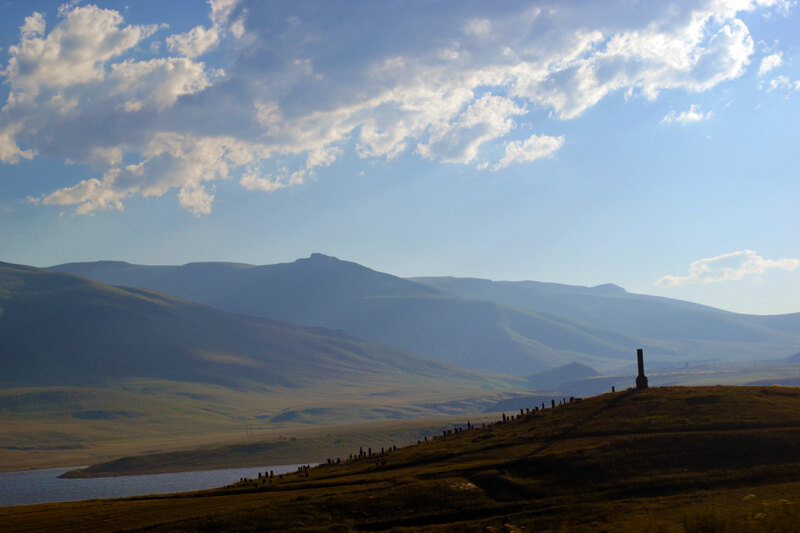 As a symbol of the Armenian people’s lost homeland, the mountain is worshipped. Kids wake up in the morning and ask “is Ararat open? !”, which I thought was rather lovely. 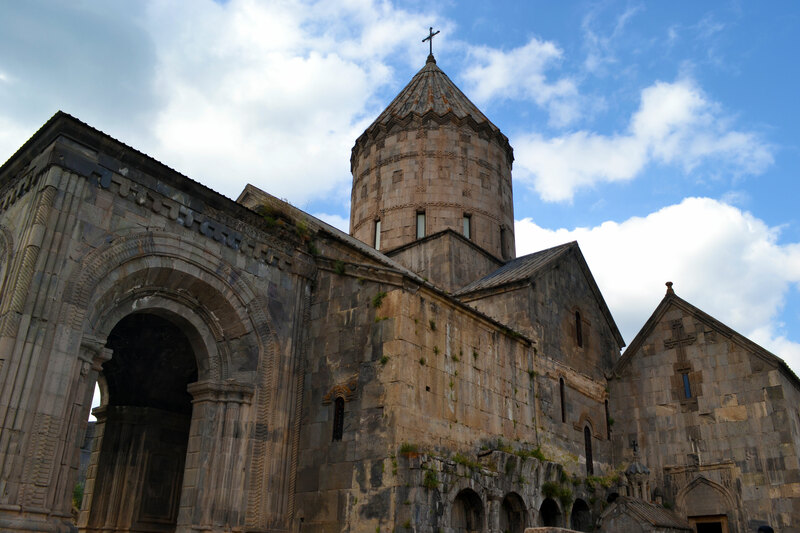 This 7thcentury monastery is where Gregory the Illuminator was supposedly held captive for trying to convert people to Christianity and is a must-see when in Armenia. 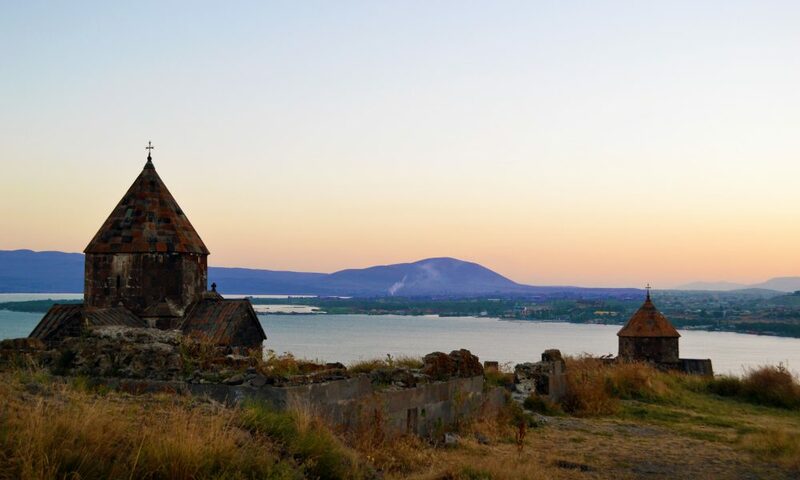 It’s also one of the most popular pilgrimages in Armenia, as it has sweeping views over nearby Mount Ararat. The cemetery stones (orange) are 19th c. The grey ones are Soviet, with images of deceased. I wanted the money shot, but of course Ararat was clouded over. 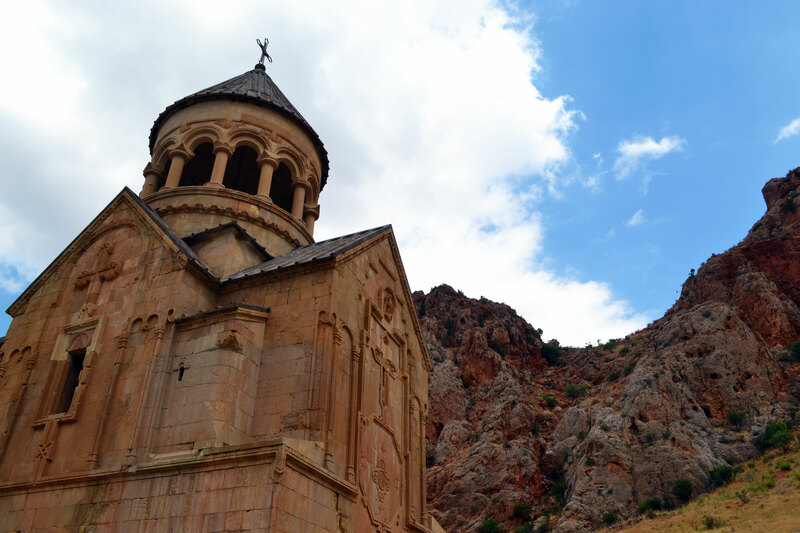 Our next stop was Noravank, a 13th century monastery in the Vayots Dzor province. 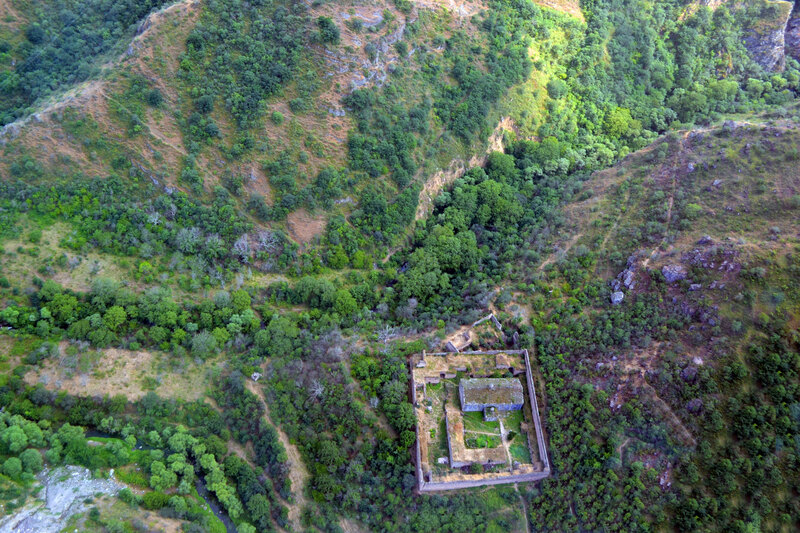 It’s sometimes known as Noravank at Amaghu, as a nod to the now abandoned village that sits above it in the canyon, but I didn’t get to see it. This was an unexpected gem in my books. Set to a backdrop of red rocks, you could easily be on your way to the Grand Canyon! 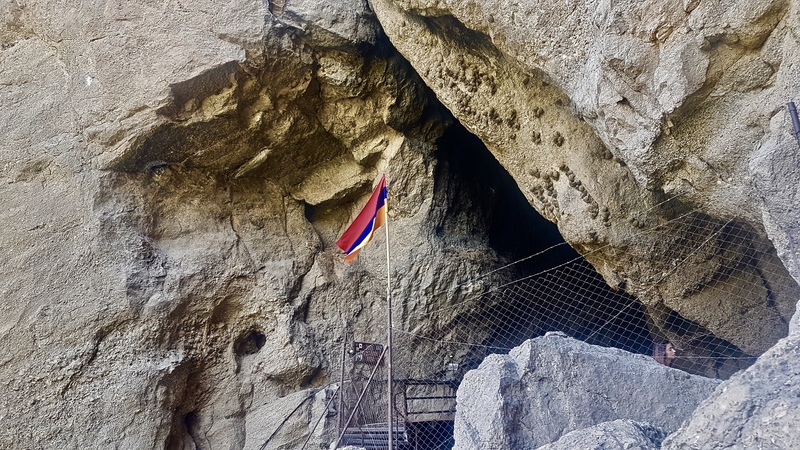 Located nearby was Areni Cave, where an excavation is currently underway to connect two caves where treasures lie. They recently succeeded in digging up the world’s oldest shoe here, which was an impressive 5,500 years old!. You could go right up to the trenches where they are still digging and observe the half buried wine casks and presses. The shoe itself, as well as brain tissues and textiles from 5,000 years ago, was said to be preserved so well due to a microclimate in the cave. Amazing! 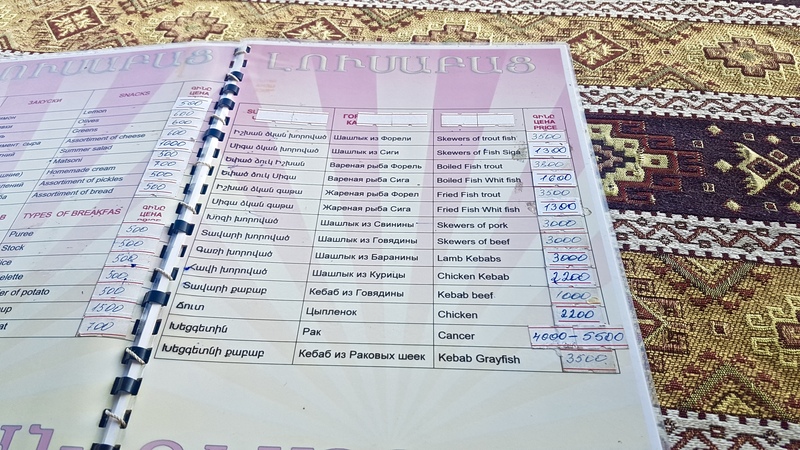 Wine consumed, caves explored and roads navigated back to Yerevan, returning to Georgia from Armenia was not without error, as you might expect, but you can read all about that and my brush with roadside ‘bistro’ food here. Visiting this crossroads between the east and the west was a wonderful experience, and one that I’d wholeheartedly recommend to anyone. 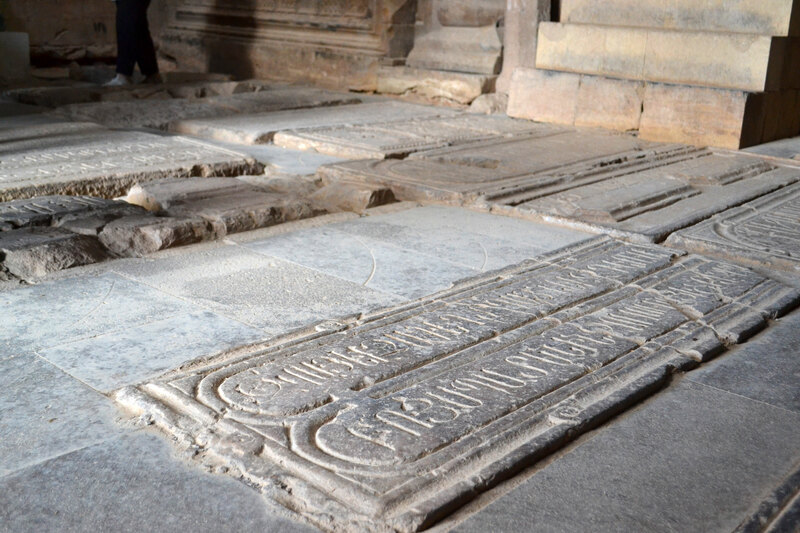 Not only was I able to engage with a complex history that has always ignited my intellectual curiosities, and one that is under-acknowledged, but I was able to explore a country that is yet to be etched on to the maps of tourists. If you can name me a country where, simultaneously, the art lover can find better treasures, the architect discover a richer tapestry of history you can touch, and the nature-lover stumble upon more beguiling horizons, let me know. From underground networks of caves and Mesrop Mashtots’ alphabet monuments, to the modern ski resort (that’s right, skiing in Armenia!) 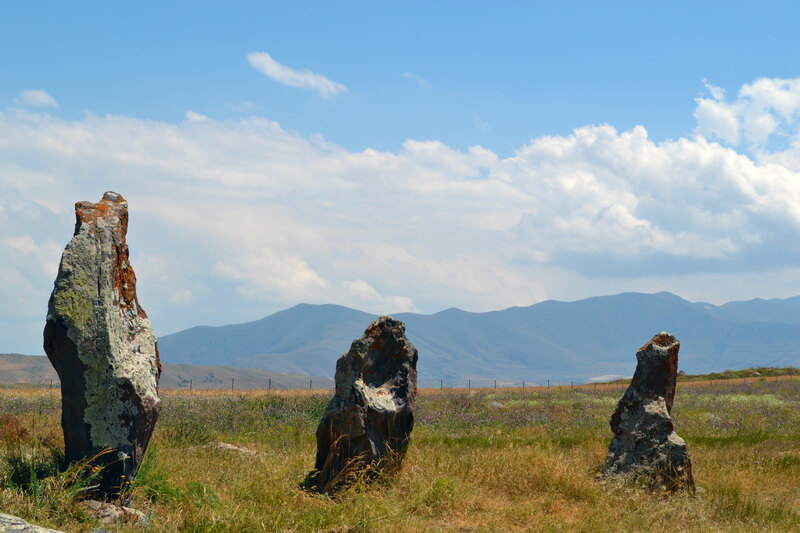 of Tsakhkadzor, you can journey through millennia and experience both old and new worlds in an instance. 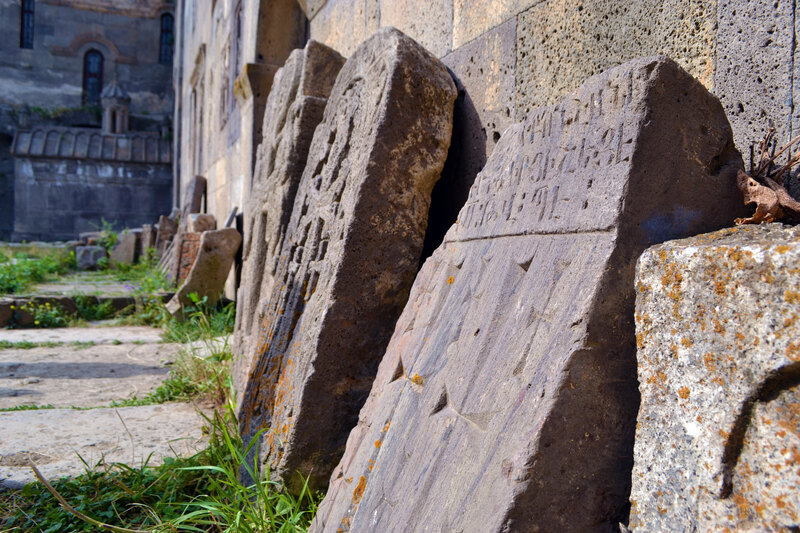 Come to Armenia and you’ll be tripping over craftmanship of distance times in the form of monuments to Christianity, Pagan Temples and so much more before you know it. 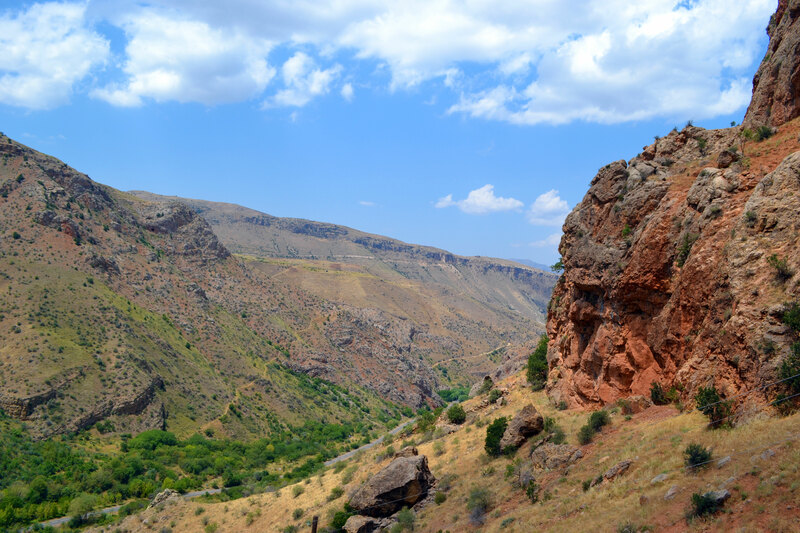 So, whether you’re a backpacker in search of hard-to-reach scenery, or a lover of fine wine looking to experience the world’s oldest winery, or like me, both, Armenia has it all, and I bloody loved it.